“The Perfect Close Workbook” by James Muir provides a deep dive into one of the most important selling skills: how to conclude each meeting with an agreed-upon next-step that your buyer is strongly bought in to. The problem with my old approach was that the customer would answer me either “yes” or “no.” Or even worse, the dreaded “call me back in a couple weeks.” As Muir points out, recommending a next-step action to a prospect is risky because it creates pressure and tension for the customer. And, if the answer the customer gave me was “no” – my sales opportunity would grind to a halt. Notice that by adding the phrase, “Would it make sense…” you take all the pressure out of the answer for the customer. You did not ask the buyer to schedule a demo. Instead, you asked a question about the timing of scheduling a demo. If the customer answers “no” they are saying that the timing for a demo now isn’t right. If you happen to get a “no” answer to your “Does it make sense…” question, you then ask the #2 question in the Perfect Close sequence, “OK. What would be a good next step?” The answer to this question is the buyer’s logical and natural next-step for them. It creates a perception in your buyer’s mind that they are in control. For sales managers, “The Perfect Close Workbook” can be especially valuable for onboarding new-hires. I say this because the topics and exercises provided are comprehensive. The book also provides exercises on maintaining a positive mindset, call planning, value creation, etc. In all, 49 practical exercises that can be completed by salespeople without a manager’s supervision. “The Perfect Close Workbook” delivers practical techniques that can be easily implemented into your existing sales process to increase sales. 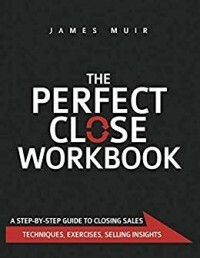 I highly recommend James Muir’s “The Perfect Close Workbook.” The technique is great, and I am already seeing positive results using it in my discussions with clients.